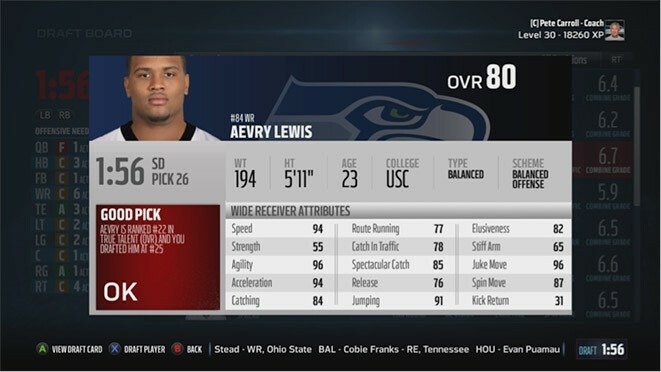 I thought about which part of Madden 16 I would feature first this year and I believe that the biggest improvement to Franchise Mode this year is in the scouting process. They are really trying their best to make you focus on the scheme of your coach and the play-style of each player on your team. While this might still be somewhat wishful thinking in terms of making the game a more ‘true to life experience’ it certainly makes it a bit more challenging and enjoyable to scout players for the upcoming draft. The one part of scouting and the draft that seems to have been hidden away for some reason is the weekly news keeping you up to date on all the latest college prospect happenings throughout the season. They are still in the game, but they are nowhere near the main page you look at each week. You have to go all the way to the far right tab and look up the league news, etc. It is terribly clunky and I can’t believe they haven’t designed the interface to be a bit more organized. Why there isn’t a page totally dedicated to the upcoming draft with mock drafts and news on draft picks is beyond me. So, with that said – here is a quick guide for scouting. If you want to draft players that will come into your team with the highest overall rating possible you need to focus on scouting and drafting according to your coaching schemes and player preferences. You can find all this information under the ‘Coach Section’ in CFM (the same area you find auto-subs, etc.). Take some time before you start your season and certainly before you start scouting (Which begins in Week 3 each regular season). If you are running a 3-4 defense chances are good that you won’t want to draft a 4-3 DE to play DE for your team at the same position (now, if you want to move him to OLB after the draft… well, we will talk about that later. Yes, your first round pick is crucial and you need to get it right. However, this is typically one player at a position you know for a fact you want to fill. In this case you know what you are looking for and shouldn’t have to spend your points on first round prospects as your options will hopefully be limited. If there isn’t a can’t-miss prospect for your team in the first round of the draft I would highly suggest shopping your pick during the draft (or even near the trade deadline if your team is looking like a playoff team (no sense in keeping a late 1st round pick when you can trade it for a future 1st and a current 2nd or 3rd Rd. pick for this coming draft. Use your points to find players at positions you are weak in the middle rounds. There are often some high 70s and low 80s players that fall into the 4th and 5th rounds – you need to uncover their draft stock and be sure to ‘Watch’ them with the Triangle or ‘Y’ button as you scout. Sure, you still can’t put players into a draftable order for your team, but the new function of ‘Watch’ is a great way to organize the players you uncover as potential goldmines in the draft. This will also be helpful for you as you get past the 2nd Round and see who is falling or who might get snagged by the CPU. Keep in mind!!! The CPU becomes a trade nazi during the draft. You might want to move up a few picks to get a guy you have a feeling might go before you get a chance. The CPU will not take a trade that might happen in the regular season – so don’t be afraid to pull the trigger on one of those players you are watching maybe a round earlier than it suggests (if you think he merits the risk). During the season and just after the Super Bowl it is crucial for you to see which players are featured on the news feed as they are often going to be ‘storyline’ players as well as decent picks to take when you get the chance. There are some other players that will be tremendous busts as well – don’t fall into that trap. Keep checking back for more tips and suggestions for your Madden 16 CFM. The NoobTubeTV Sliders and Setting will also be uploaded to PS4 servers and shared here shortly!